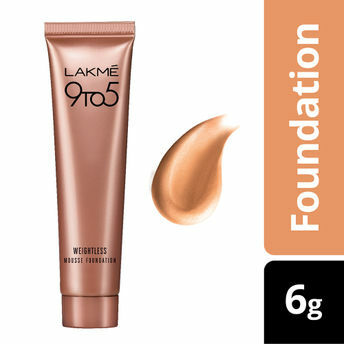 LakmE 9 To 5 Weightless Mousse Foundation is your answer to a workings women's barrier to using foundation. It is a lightweight foundation meant for everyday use. It is so lightweight that you won't even feel you are wearing foundation. It not only blends in effortlessly, but gives a matte finish that lasts through the day. It is available in 2 shades in mini pack and is extremely convenient to carry. Foundation with new formula that feels soft and incredibly weightless and is perfect for everyday office use. It blends effortlessly onto skin to conceal imperfections with a matte finish that stays through the day. With complete coverage It's a foundation so weightless you may forget you are wearing any foundation, Matte finish in a weightless mousse texture, Pocket sized tube that is easy to carry around, Complete coverage, Lightweight and long wear, Available in 2 office-wear shades - Rose Ivory, Beige Vanilla. it is suitable for all skin types and is Dermatologically tested. Alternatively, you can also find many more products from the Lakme 9 to 5 Weightless Mini Mousse Foundation range.